Planning a place for your parents doesn't have to be pedestrian. If ever there was a love story this is it. Holistic health coach Katie McDonald and her husband, Scott, were married in 1990. Their wedding weekend celebration was held right on this spot. Zoom ahead and, sadly, Katie’s father dies. Her mother sells the house to the couple, who hire the Providence architectural firm 3six0 for an award-winning renovation. Not long after, Scott’s mother faced major health problems. Wanting to provide his parents security — but also aware it was important to safeguard the privacy of their family, which includes a teenage son — Katie and Scott turned back to 3six0 for help. Western red cedar links the harmonious components — main house, in-law residence (where the old garage once stood) and new garage — together. The screen serves up privacy but doesn’t block light to the parents’ entry porch. 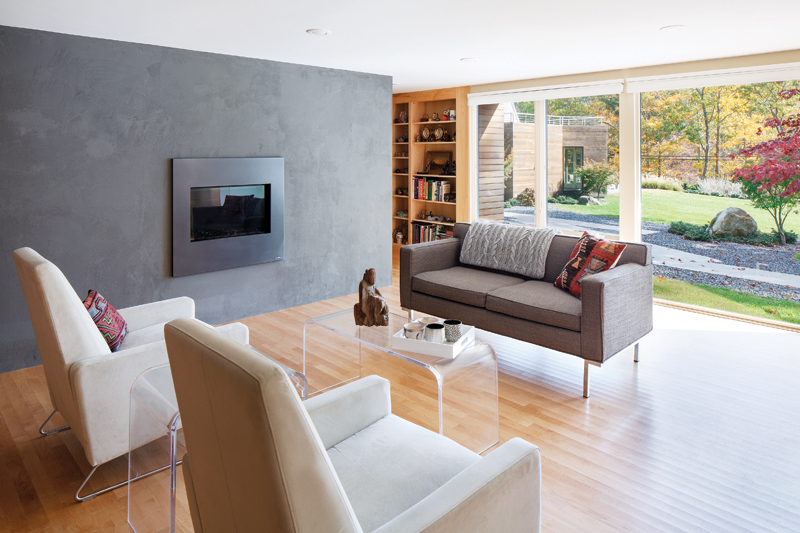 A pigmented plaster wall with a gas fireplace frames the main living space. Along with Jack Ryan, the firm’s senior associate and project architect, they set about creating an in-law apartment that would mirror the polished and contemporary aesthetic of their home. “We designed everything to be barrier-free. No steps. Curbless shower. Large pocket doors that open out of the way,” Ryan explains. Less than 1,000 square feet (as designated by North Kingstown zoning), the thoughtfully planned residence lacks for nothing including water views. From their sunny living room, Scott’s parents watch birds skim the surface of Narrow River. And — even better — their grandson head off to school. Aging in place translates to anticipating problems. Here, foreseeing the possibility of a wheelchair, Ryan devised a dining table (above) that can also double as an accessible work surface. Doors are three feet wide (two frameless glass doors provide a four-foot opening into the shower) for that same purpose. The light-gathering floors are maple. Norm Machon of Exeter’s Machon Custom Builders was the project contractor. Elderly parents are not always easily convinced to do what is in their best interest. And meshing their lives with ours is tricky business. “We had to consider how we could meet their needs and also be future-wise,” says Katie. Then, there are the logistics of condensing a long history into what is usually much smaller quarters. Scott’s parents, for example, were collectors. Their new abode, built with what Katie labels “ship-like efficiency,” could hold only so much. Bit by bit (stages are best, Katie cautions) they winnowed it down. The baskets, clocks and old-time radios that made the cut lend Scott’s parents a feeling of home. The user-friendly layout is designed like a loop: A mini-office leads the way to the bedroom and roomy bath. Beyond lies the TV alcove and central living area. If deciding to invite elderly parents into your world wasn’t monumental enough (“Do it before you need it,” says Katie), there are myriad restrictions for accessory dwellings. Ryan recommends consulting an architect to review zoning and building department regulations, which vary according to location. Typical ones include everything from, say, lot size and property setbacks to a septic system review. But even looks count. In North Kingstown, “the principal structure must maintain the appearance of a single family residence,” Ryan tells us. (Thus, the in-law’s cool screened entry). Still, in the end, the headaches are worth knowing the people you care about are safe. And, in truth, forging a sweet place for ourselves — should the need arise — is no small matter either. Who knows what the future holds? Let’s just hope we meet it with all the grace and wisdom the McDonalds have shown.